Introducing our new 8pc pull rod kit. an economical and efficient tool to fix dents on car bodies. just drill, pull, fill, sand and paint from outside the car body. hooks are made of rust resistant alloy steel. drill bits are not under warranty. The V8 3001 is the only radiator hose cutter of its kind on the market today. It can cut large diameter hose up to 2-1/2"
The current tools for cutting automotive radiator hoses include razor blades and hacksaws. Both of these tools are time-consuming and leave ragged edges. They are increasingly inadquate as the hoses used in new cars become thicker and stronger. It will take about 10-15 minutes to cut a new Benz hose and the cut will not be straight and clean. Using a hacksaw will take as long and will have an unprofessional looking edge. Our new V8 3001 can make a straight and clean cut in barely a few seconds. This is a new tool every professional must have. Easily mount the V8 3001 to the top of your workbench, becoming a stationary tool. Durable aluminum construction. Screws included. For large diameter hoses up to 2-1/2". 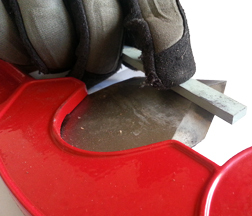 Pro Users tip: Lubricating the blade before cutting, makes for easier cuts & increases the life of the blade. This superfine 400 grit stone will extend the lifetime, and improve the performance of your 30011 blade. Our unique head design allows for sharper bends without collapsing the tubing or leaving a deep mark on the surface. 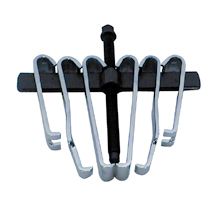 When closed, the two handles are more than 3-1/4" apart and allow enough leverage to bend tough steel tubing easily. You may hold tubing firmly to align and adjust. Our V8 tubing benders are among the Top 100 most requested tools by the readers of the Professional Tool and Equipment News for 2010. They are also a favorite among mechanics, fabricators, and custom car builders at every tool show V8 has participated. One of the most difficult tasks for mechanics to master is fabricating tubing for cars and trucks. 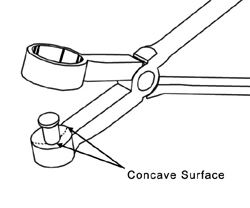 Previous tool designs had trouble making sharp bends, close compound bends, or 90 degree bends near mounted fittings. After all the bending, the tubing almost never fits perfectly onto the vehicle. Adjusting on cars is always difficult. V8 Tools’ unique designs can make all types of bends quick and easy. You also can mount one end of the tubing onto the car and fine tune the bends to make the other end fit. Our benders give the user greater leverage, even when working with larger steel tubing. 1/4” for brake lines on larger cars and pick-ups and some cooling lines. 5/16” for cooling and fuel lines. By popular request, we put all three sizes in a strong canvas pouch and they are now available as a set. V8 tubing benders are among the Top 100 most requested tools by the readers of the Professional Tool and Equipment News for 2010. They are also a favorite among mechanics, fabricators, and custom car builders at every tool show V8 has participated. For Mercedes-Benz with automatic transmissions, all years, some Ford models and others. 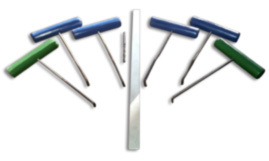 This tool will easily and safely push tough nylon bushings into place. Works on different bushing sizes. 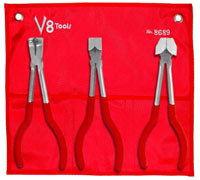 Save yourself headaches & time with this innovative tool from V8 Tools. Manufacturer's note: Sale of this item will discontinued once our inventory has been exhausted. Brake spring removal and installation is always a tough job. A widely used tool for this job happens to be a pair of end cutters. V8 has improved the tool by making it longer and with wider and stronger tips that can hold the spring better without leaving a deep cutting mark. 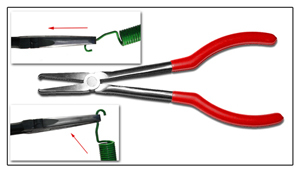 These new "brake spring pliers" offer more grip and control, making brake jobs fast and easy. 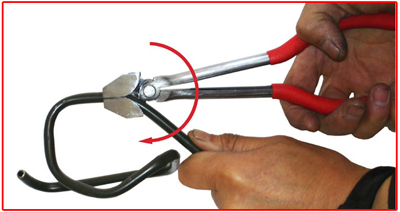 "These pliers are also great for removing and installing brake "shoe" return springs, shoe springs, pawl return springs, parking brake strut & strut springs, parking brake lever "C" clips. 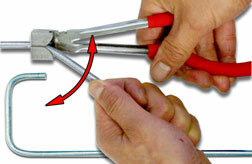 Great in bending and removing and installing bearing "nut lock" cotter pins. On worn out brake pads use the flat sides of the plier jaws to push-in caliper pistons to remove pads. Great for under hood work, old head lamp springs and auto door locking & unlocking hardware apparatus." Thank you, Cyberphill for your great new uses for the V8-989! Caution: When using our tools, always remember to wear protective eyewear and gloves! Strong, light and durable aluminum construction. Simple push-on and pull-off action. Thin lips slide under tight hose couplings quickly. 2 of the most popular sizes for most cars. Color keyed for easy identification. Durable and soft powder coating will not scratch tubing. 6 of the most popular sizes for most cars. Angled to make it easier to get into confined spaces. 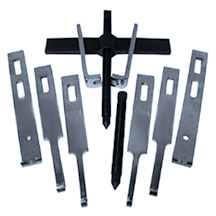 We have updated our angle disconnect tool set to cover more. newer GM, Chrysler & Ford cars & trucks. We rounded the outside edges of the lips for easier usage. Improvements on machining & powder coating. As an added safety feature, the central screw is non-hardened. When overloaded the screw will safely strip preventing breakage of other parts. The 3803 is V8's clip-on magnetic parts dish. Convenient and durable, perfect for holding on to easily lost parts and tools. 3 powerful rare earth magnets. Made of very strong plastic. Special design allows it to hold longer parts and tools. Supercharge it to pick up an amazing 3.3lbs! Our V8 3822 comes with a 2.2lbs pull small head rare earth magnet, that can pickup parts and tools in small cracks. On ocassions when you need a more powerful pickup tool, you simply put on our supercharger and increase the power to 3.3lbs. Telescoping body extends to over 2 feet long. Warning: Keep magnets away from Pacemakers. The Mighty Worm can reach places others cannot! Extremely small magnetic head, barely 5mm in dia. The head is mounted on an extremely flexible 30" long copper wire. Extremely powerful, It will pick up more than 1/2lb. Extremely useful in picking up parts in small gaps, like a Mighty Worm. 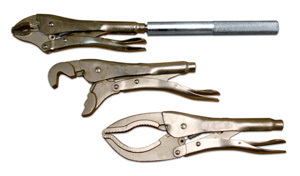 Double the torque & reach of your favorite locking pliers. Made of heat-treated alloy steel. Fits most popular brands. Get more out of your existing toolbox. Heated computer Keyboard keeps your hands warm for those cold shops! Perfect for shops in the cold, winter months! UL listed. 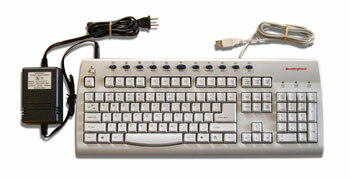 The keyboard does have a separate 110v power supply.